I’m sitting here watching Reveal the Path and laughing out loud a bit because in about the first five minutes, the groups Scottish bikepacking route has turned quickly to ‘bike mountaineering’…. my arms start aching again just thinking about it. 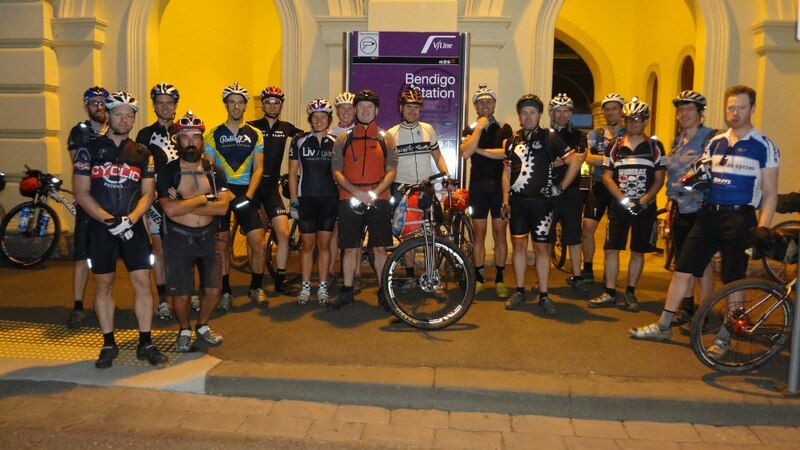 So rewind two weeks and it is Saturday morning, 9th March, and I am at Bendigo train station at 7am with a bunch of other nutters ready to ride 400km along parts of the Great Diving Trail, local singletrack and who knew what else. I didn’t know what else, that’s fore sure! Admittedly, having only heard about the GDT bikepacking event through some FB stalking a few weeks before, I was going in the deep end a little. I had never been to Bendigo, Castlemaine, Ballarat or even heard of Bachus Marsh. But apart from being an awesome new adventure, I desperately needed some acquaintance time with my GPS and SPOT, some time to get to know the nooks and crannies of my bike. Only experience can determine what works and what doesn’t! This was probably the best bit of the trip for me! The group quickly started to split up: the fast boys with little-to-no gear sped off never to be seen again. A group of us including Courtney and Al rode together for a while as we got used to riding the singletrack on fully loaded bikes. The rocky but flowing singletrack was split up by sections of firetrail alongside water races. 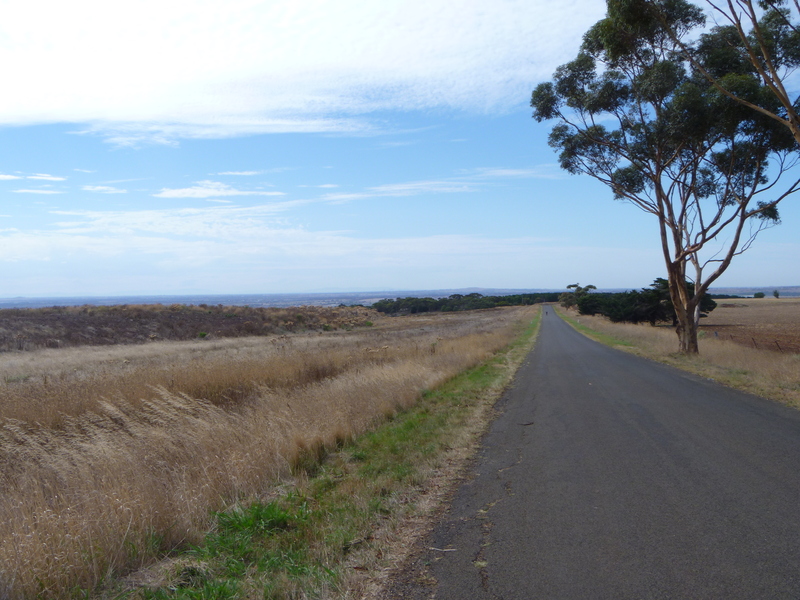 There were some decent hills which rewarded us with some great views back to Bendigo and surrounds. It took me a while to get into the swing of things and hours soon rolled into each other in a blur of fun. The only real thing I struggled with on this leg was the gates. So many gates. My bike was heavily loaded and even with fresh arms, by the time I had hauled that thing in every way imaginable over more gates than I would dare to guess at, my shoulder was feeling niggly. It is definitely a weak point which I often don’t use because I am riding (not bench-pressing) my bike. We rolled into Castlemaine well before lunch with no real dramas. After a restock of the tummy, the water and the food bag we were off. Temperatures were rising quickly and by 12pm it was well over 30 degrees. We had left town in dribs and drabs, our group was now quite split up. After not being able to ride the singletrack with the finesse of others around me, I found myself riding alone for a while. It was nice to set my own speed and navigate with the GPS myself. I was quite impressed that I got the hang of the Etrex quite quickly. Not too much to do really though, point and ride! Dalesford came and went and as we approached well over 150km for the day the legs were getting a bit weary and crampy. I had guzzled my water in the heat. Silly. And with every corner we were expecting Creswick. I don’t think we really knew what we expected, just some form of civilisation that led us to a town. It never came. Instead we were treated to some twisty and technical singletrack that stomped my previously high spirits right into the ground. I was out of water and I was hungry but I couldn’t eat without water. Why didn’t I even bring a gel? Mistake #1: not knowing your route and not having a cheat sheet handy. Then the cramps set in good and proper. Straight up the hamstrings and adductors in both legs. I was whimpering along in such a miserable fashion, poor Courts must have thought I was goooooone. We rolled into Ballarat around 10pm and I went straight to Maccy D’s. I guzzled down water, french fries, a burger, banana bread, sprite and two hot apple pies. Delirious and so dirty that I could have easily been mistaken for a lycra-clad hobo, I stood around out the front of MacDonalds deciding what to do. A few others were keen to keep riding. I went along with the idea but after about 10 minutes cramps returned and I knew I needed rest. I stopped on the outskirts of town with Jarrod Dellamarta and setup camp for the night. Mistake #2: not having a plan and going to bed without setting an alarm! I woke up with the sun, but this was close to 7am. Having not set my alarm and getting away in the dark, little did I know the detrimental effects this would have to the rest of my race! This leg cruised by. 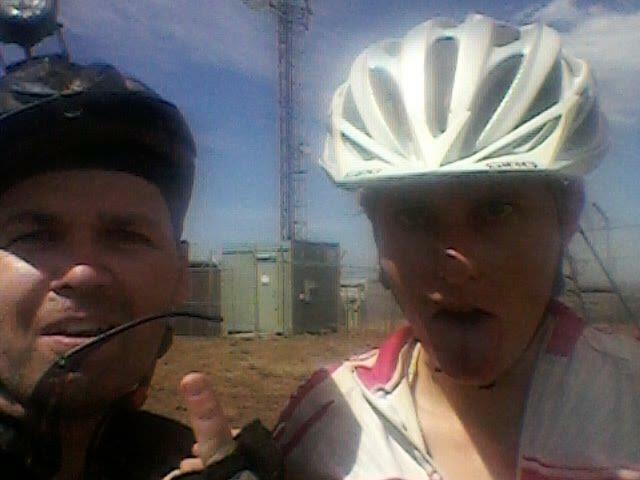 Jarrod and I riding together sometimes, sometimes not. Maybe he got sick of me asking a thousand and one questions about Tour Divide, cause after a while the gap between us stretched far enough for no conversation. Open roads, a fair bit of downhill, superb views. We could see Melbourne sykscrapers on the horizon as we made our final descent down into Bachus Marsh. Our VERY matching Niners parked at BM subway, I watched Jarrod devour a footlong Sub and then a six-inch a few minutes later. I was jealous as I struggled to get mine down in the heat. It was 12pm and I was looking at the elevation of the next section: uphill for about 50km and it was already 36 degrees…. I left before Jarrod but would later find out he had decided to pull out, the heat was getting to him. Smart move! I began the uphill crawl out of town, taking many stops to sit and rest up that god-awful hike a bike to the Telstra tower. It was like riding your bike in an oven. Sweat was pouring off me like a river and there was next to no shade. The firetrail hike-a-bike mountain was fine, I could deal with that because after going up up up I knew we were going down. The ‘singletrack’ section of O’briens however, was just plain hard. I am deliriously scared of heights and as a consequence walked for over two hours here. The combination of the deadly drop to the right, the cliff face on my left and awkward logs and rocks to scramble over left me screaming Ryan’s name out loud for hours. In Blackwood I met a lovely man who let me use his brand-spanking-new outhouse (it was very very fancy but also traditional looking with the wood shingles) while we got me some cordial. I must have looked like sh*t because he seemed pretty concerned. After Blackwood I pushed, shoved, sat, cried, swore, dragged, sang, shouted and whatever it took to get my bike through the rotten section of ‘singletrack’. It got to about 8pm and I was struggling to see. I knew Daleford couldn’t be that far but I was moving at snails pace. I had neglected to take a good head torch, all I had was my dynamo light and a small camping head torch. I was walking five meters, spinning my wheel to get some light, walking again, spinning… this lasted all of about 15 minutes and I stopped to make camp. With only a few gulps of water in my camleback I saved it, had half a muesli bar and attempted to sleep. I was in agony with cramps. Rigid straight legs, whole body shaking from heat exhaustion. This is quite a bit more scary for me with epilepsy because it almost feels like a seizure. It wasn’t, but it made me panic and I lay there awake for hours. At 1am I saw a light and heard a “hello?” B-RAD! We chatted about how far it was to Dalesford (neither of us could really estimate), about water and the trip in general. He pushed on and I went to sleep with comfort in the fact that I was only semi alone out here in the middle of the state forest, and at least B-RAD knew where I was to be found if I never returned! I got up early (5am) and made tracks to Dalesford in the dark. It was easy going and I wish I might have persevered those final few hours the night before. In Dalesford at 8am on a public holiday I just looked for the closest place that was open. Some fancy snob cafe with eggs and bacon. PERFECT! Having not slept really all night, not showered or washed for now the third day, I got some good looks. I sat down, changed SPOT batteries, called Ryan and then proceeded to eat their ‘big breakfast’ a juice, coffee and water. I filled up all water capacity and rolled out in high spirits just before 9am to make the last push to the finish. As before, firetrail turned to singletrack, singletrack to rocky pinch-climbs, rocky to hike-a-bike and then to completely horrifying and unrideable moto track. I was physically shattered and emotionally pretty distraught. I was standing at the top of these entry lines to big creek beds and erosion gullies balling my eyes out. At one point I just pointed my bike downwards, let it go and ran down after it. I made it back to the highway and sat down under a tree. It was 36 degrees, I couldn’t think straight. I rang Ryan to ask what the final 12km were like and he was brutally honest “like that bit but worse, very rocky, very technical”. And with that, I was out. I called Courtney from Fryerstown and got a lift back to Castelmaine. I tried so hard to put on a positive face but I was so demoralised. All over red rover. Pizza, pasta, chocolate milk and a good arvo snooze got me back on track. I was feeling pretty good the next day and was a bit more open to the experiences I had just put myself through! An awesome amount of organising went into running this ‘not-event’ and so big thanks to Ryan and the boys for that. Well done to all the other riders, and big thanks for Courts and Al for giving me somewhere to stay and looking after me. Biggest thanks go to Seb who helped me for days setting all my gear up and for giving up his front suspension over the long weekend just so I could ride. 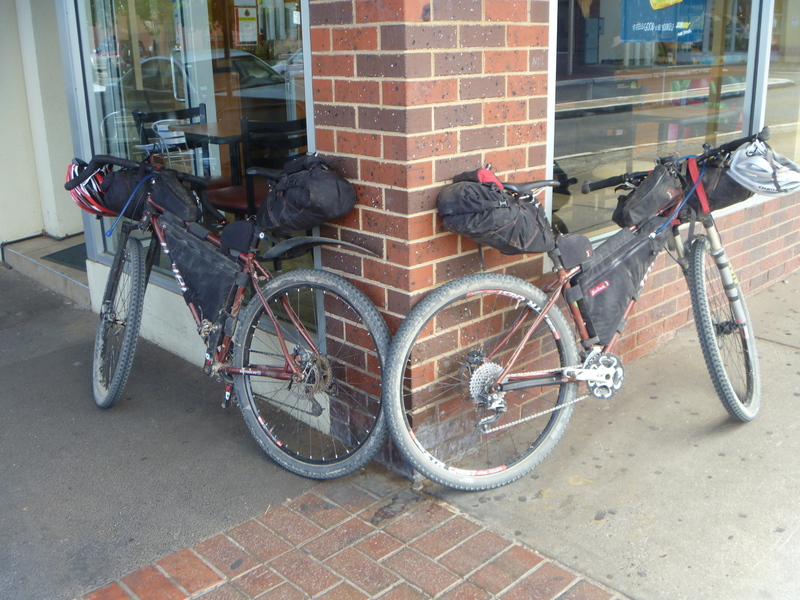 Bikepacking in Australia is well and truly alive! 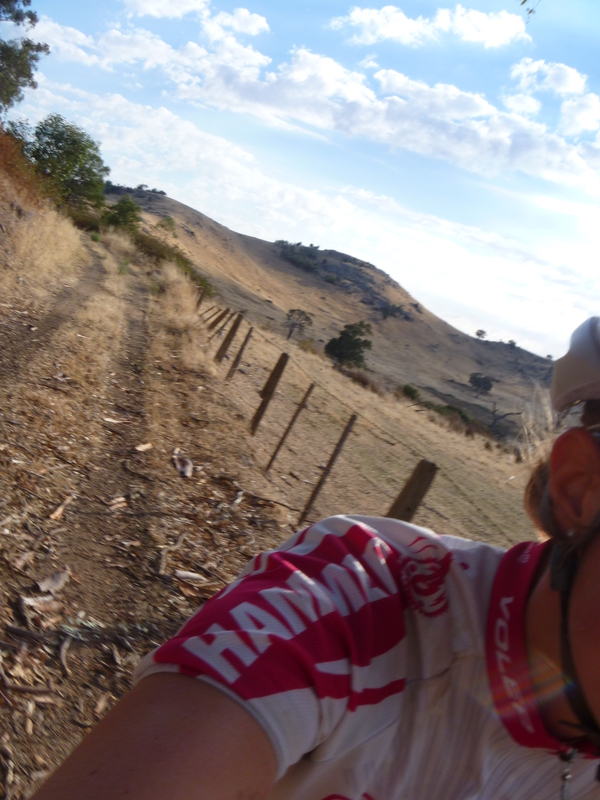 This entry was posted in BikingBethany and tagged Australia, Bendigo, bikepacking, Castlemaine, climb, epic rides, Great Dividing Trail, niner mcr, revelate designs on March 20, 2013 by bethany. 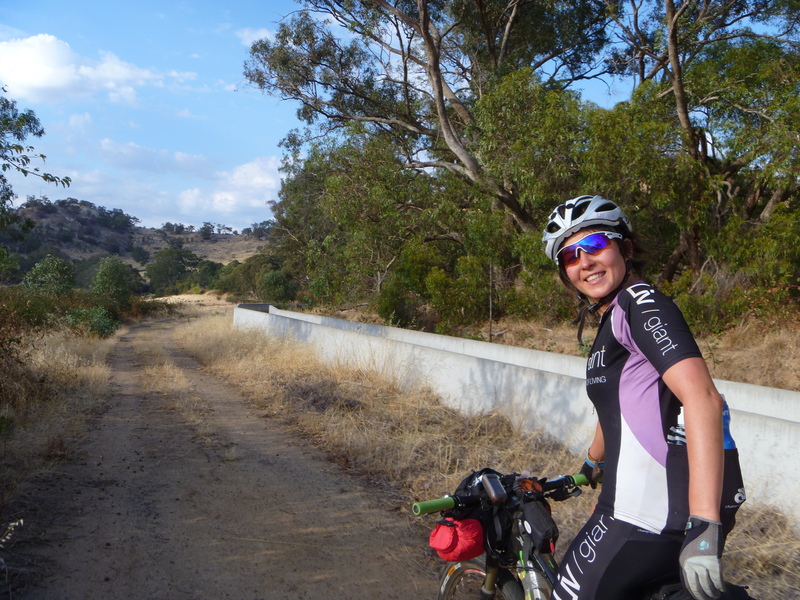 This afternoon I am jumping in the car and driving 7 hours to Castlemaine, Victoria, for the inaugural Great Diving Trail (GDT) Bikepacking event. The loop is about 400km in length and circular-ish: starting from Bendigo we’ll head -> Castlemaine -> Daylesford -> Ballarat -> Mt Bunninyong (all via the GDT). From the top we’ll make our way down to Bacchus Marsh via Ballan singletrack and then follow the path Bacchus Marsh -> Daylesford -> Castlemaine. All up there should be around 9000 vertical meters climbing, so not a walk in the park! With temperatures expected between 30 – 35 degrees C during the day and not dropping below about 12 overnight, I have decided to go without a sleeping bag. I have my Tarptent tent, sleeping mat and silk liner. Hopefully combined with my puff jacket (should it come to that) I’ll be fine! 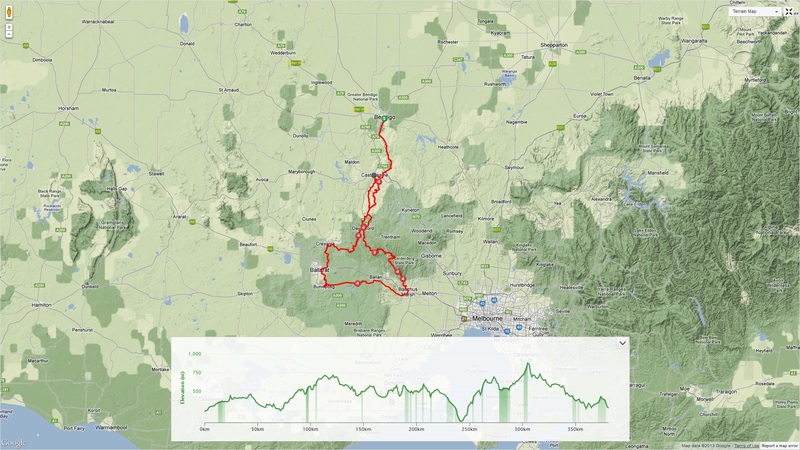 This will be my first time navigating with the Garmin ETrex, so here’s hoping I come out of the Victorian bush alive… My only goal is to finish, or complete what I can without injury. It will be a steep learning curve I fear, but that is what adventures are about right? Report to come later next week!! 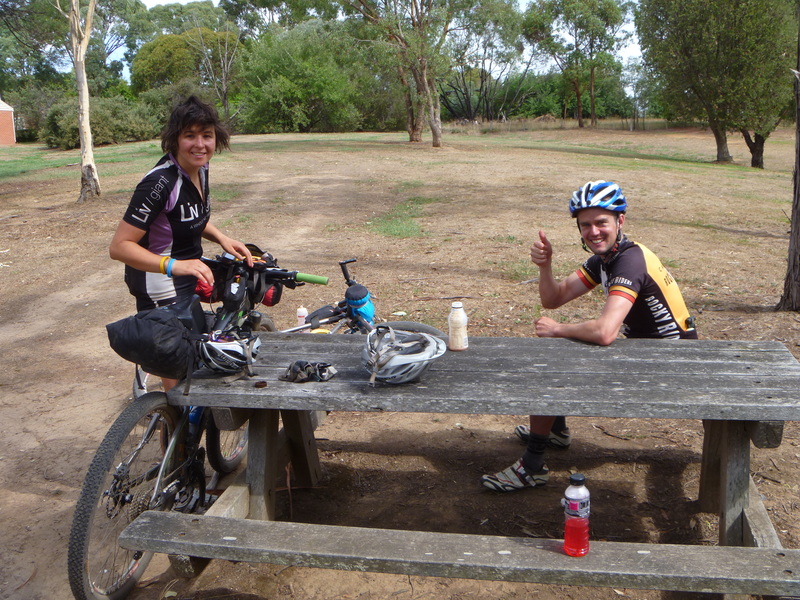 This entry was posted in BikingBethany and tagged Australia, Bendigo, bikepacking, Castlemaine, climb, epic rides, Great Dividing Trail on March 8, 2013 by bethany.